In-ceiling High Definition PTZ Camera that is perfect for the sleek look in offices and department stores. It is very similar to its outdoor sibling, the 1080P HD-CVI PTZ Camera with 20X Zoom, with all the same great features like 20X optical zoom, high speed motor that enables the camera to move quickly, and low lux light sensitivity. The 20X optical zoom will allow you to see a face up to up 130ft away. The camera also has Digital Wide Dynamic Range (DWDR) to help minimize light glare. It can do continuous 360 degree pan, and can do a 180 degree tilt with auto-flip. Like any professional PTZ camera, it also allows the user to set up to 255 presets using our HDCVI DVR, and up to 5 patterns or 8 tour sets. Setting PTZ tours is easy when used with our HDCVI DVRs by accessing the OSD on the camera with the touch of a button. If you don't need 20X zoom, and 12X optical zoom is sufficient for your application, then be sure to checkout the In-Ceiling 12X Zoom HD Mini PTZ. If you're looking for night vision, then be sure to take a look at the 2 Megapixel HD-CVI Night Vision PTZ Camera. Be sure to use on of our HDCVI DVRs when using this camera. Wiring this camera is much easier compared to traditional analog PTZ cameras. 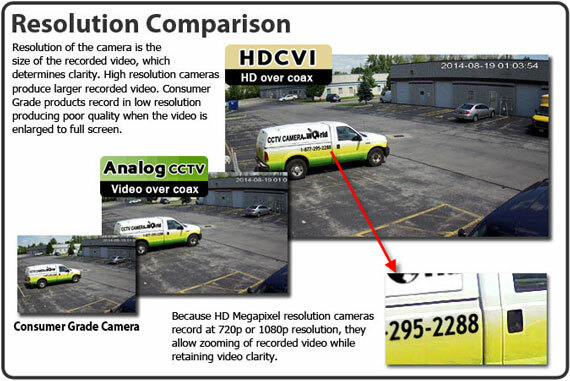 The new HDCVI technology allows you to run your cameras up to 1600ft without losing video quality, and simplifies wiring of PTZ cameras. You no longer have to run multiple wires to connect a PTZ camera to the DVR. Simply power the camera using the included power supply, and run one good coax cable from the camera to the DVR. That one coax cable can carry the video and RS485 data signals over it to a HDCVI DVR. If you are setting the camera for control from a security station, you can also use our PTZ joystick controller and connect it to the RS485 outputs from the camera or DVR. If you need help, with every purchase you get free technical support for the product purchased. CCTV Camera World also offers free mobile apps and computer software so you can view your cameras connected to our DVRs over the internet using your smartphone (iPhone, Android, or Windows Phone), tablet (Android or iPad), or PC/Mac computer.